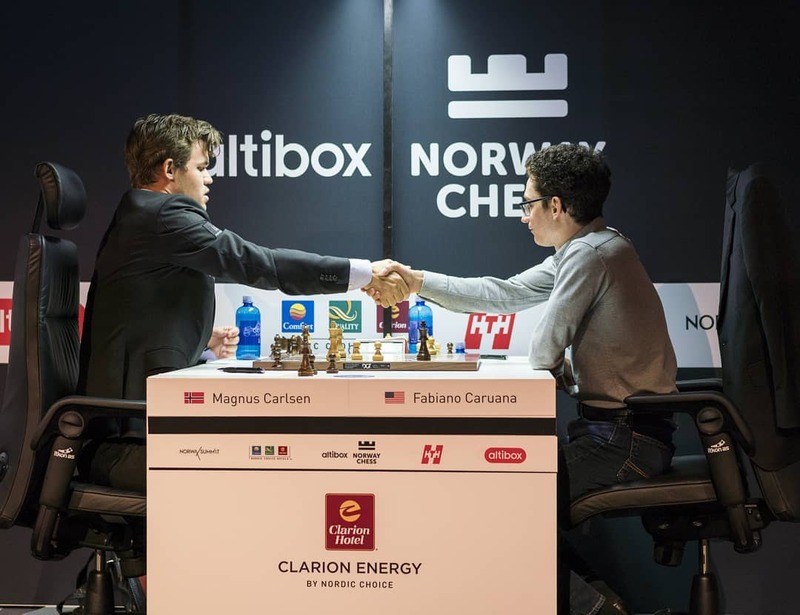 World Champion Magnus Carlsen has beaten his upcoming challenger Fabiano Caruana in Round 1 of the 2018 edition of Altibox Norway Chess, opening up a 36-point lead at the top of the live rating list. Magnus called the win “a confidence builder”, and what was only his second win in the opening round of a closed tournament since 2014 also gave him the lead as the other four games were drawn. Hikaru Nakamura came closest to drawing blood, but Ding Liren escaped again to stretch his unbeaten streak to an astonishing 73 games. 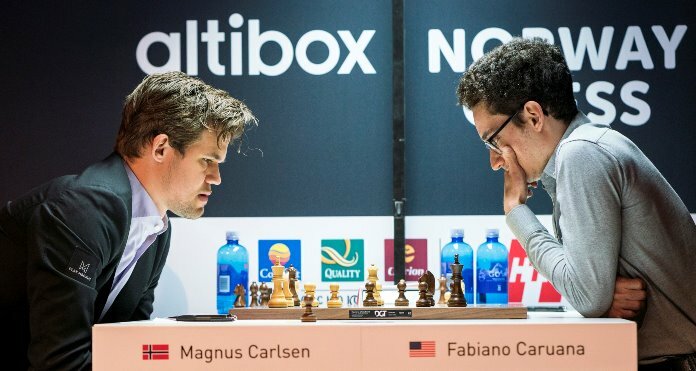 There was no question about the game of the day in Round 1 of Altibox Norway Chess, and it lived up to its billing! Peter Svidler and Jan Gustafsson were again commentating on all the action, including the final hour or two of the Carlsen-Caruana game when the outcome was no longer in doubt. Needless to say, it was a lot of fun! Perhaps Caruana was finally feeling groggy after his incredible run of tournaments from March onwards. 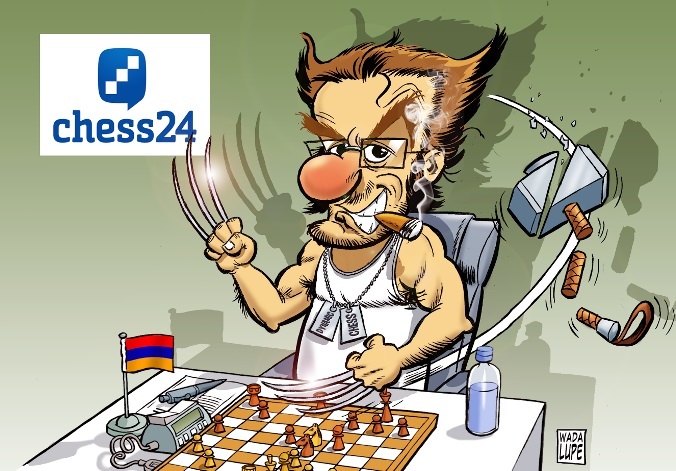 If he had pulled out it would have mirrored Sergey Karjakin’s decision to skip the tournament in 2016 after he won the Candidates, and might have meant that the last Carlsen-Caruana clash before their match in November was the first round of the GRENKE Chess Classic. 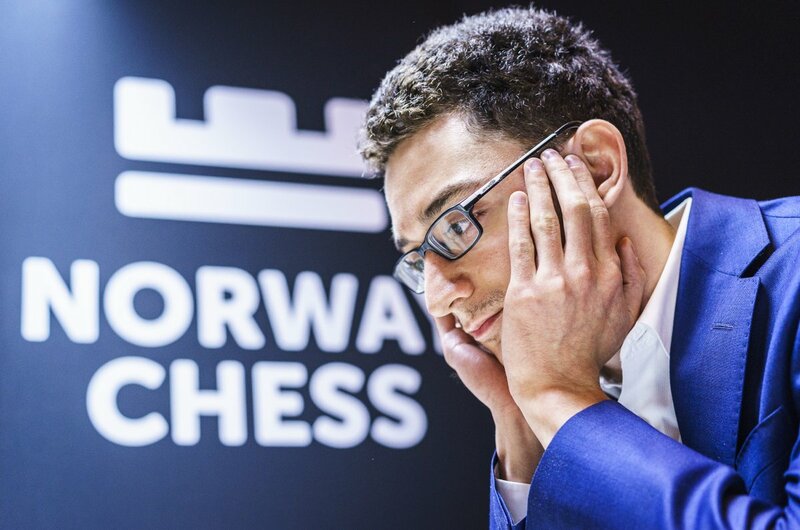 There Magnus had looked certain to win only to find himself in a study-like ending which his opponent held before going on to win the tournament in style - advantage Caruana. This time, though, Fabiano couldn’t escape the champion’s clutches. Basically White is not pretending to play for too much, but as you can see, although the position is fairly balanced the pawn structure is not completely symmetrical, so there’s something to play for for both sides. It was a principled struggle as Caruana went for 12…b5!? Magnus poured more oil on the fire by going for a positional pawn sacrifice with 15.Ne3 Bb7 16.d4 e4 17.Ne5! The World Champion hadn’t gone for this lightly, but not because of what happened in the game – after 17…Nxe5!? 18.dxe5 Rxe5 19.Qd4 Carlsen’s only question was, “am I really better, or is my position just comfortable?” What he was concerned about was the exchange sacrifice 17…Rxe5! – “I think this was just completely unclear”. It does seem as though after that move Fabiano would have got an active position much more in his style, while in the game he was at risk of getting slowly asphyxiated. His position is unpleasant, but I’m really not sure if I can make serious progress. The problem was that maybe it’s harder for him to find a move… but when he went for this it’s just much worse. I think it’s more of a modern standpoint – you go for whatever chances there are. If there’s a 1% chances of winning the game you should keep going, even if it ends up with punishing you. I wasn’t enjoying it, I was nervous. I didn’t want to screw up! [Caruana] does to some extent seem to be a different player in these championship events from otherwise, so I know that I cannot expect to win like this every game, but for sure, to beat such a strong player is a confidence builder for me. He’s a pro, he doesn’t like losing, but I think he also feels that he can do better and he’ll put this game behind him. He was referencing an English football cliché dating back to a football pundit in 2010 talking about the brilliance of Lionel Messi before asking, “but can he do it on a cold, winter night in Stoke?” Stoke City have just been relegated from the top division, but for years were famous for roughing up all-star opposition at their home ground. London is of course the planned venue for this year’s World Championship match. And Magnus is Messi. Carlsen wasn’t getting carried away, though, and commented, “I think it’s a bigger blow for [Caruana] in terms of this tournament than for the World Championship”. In a way it’s a shock for Magnus, too! It’s an unusual situation for me. I haven’t won the first round for ages, so I don’t know how to deal with it! No. My dentist told me the next days will be better. Here he played 11.cxd5, and later pointed out that he’d prepared the trick 11…e4? 12.dxc6! exf3 13.Bxf3 Qc7 14.cxb7!, but added, “probably it only works in blitz!” Instead after 11…cxd5 12.dxe5 Nxe5 Black was doing fine, though Sergey felt he went on to misplay the ending somewhat and also got into time trouble, making the control on move 40 with just 13 seconds to spare. 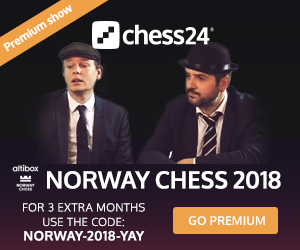 Will Levon show the same ruthless streak that enabled him to beat Magnus and win Norway Chess last year? Anand-Aronian saw something like the trick line above appear on the board, with 8…a6!? I was just telling Levon that even though I was aware of this idea I wasn’t able to spend a lot of time on it, since there isn’t a sub-system in the Anti-Berlin that Levon doesn’t play. So I spread myself too thin. The final draw was the one other absolutely full-blooded encounter of the day. With Black Ding Liren repeated something his opponent Hikaru Nakamura had played the day before, but 9…Qa5 was a novelty he’d cooked up for the Candidates with his second Wei Yi. For a while Black was doing well, but Ding admitted to simply having missed 18.Bg4! He responded 18…Bxg4 19.Qxg4 h5! ?, which Hikaru described as “a little bit crazy”. Soon Nakamura decided, most likely correctly, to go for a direct assault on the black king rather than play on the queenside, but the Chinese no. 1 hadn’t gone on a 72-game unbeaten streak without showing great determination in defence. Ding was even ready to seize the initiative after playing 30…Ng6? …but it seems that Nd6 and potentially Nc8 are coming, and the e-pawn is stronger than Black’s play on both the queenside and kingside. It was very far from trivial, though, and the players struggled to find anything in the post-mortem either. So the standings after Round 1 are of course that Magnus is top, Fabiano bottom and everyone else has half a point. In Round 2 Carlsen has Black against his past challenger Karjakin, while Caruana can try to give Mamedyarov more than toothache to worry about. It’s such a powerful field, though, that all the pairings deserve a mention: Ding Liren-MVL, Aronian-So and Nakamura-Anand are the other games to savour. Don’t miss our live coverage with Peter Svidler and Jan Gustafsson!